18-karat yellow gold plated case. 120 pave white diamonds set in bezel; 0.66 total diamond carat weight. 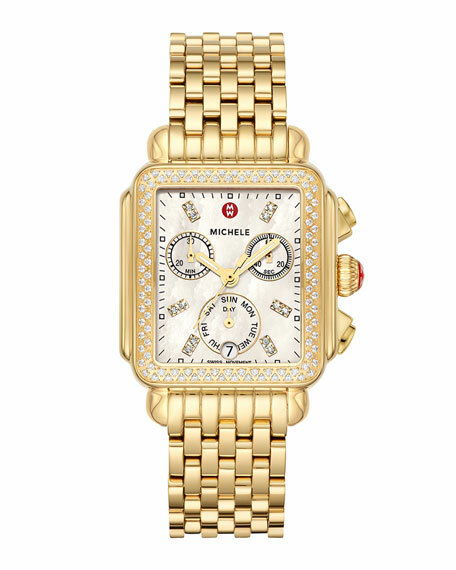 Natural mother-of-pearl dial with yellow gold-set diamond numeral markers. Three sub-dials measure second, minute, and date function. Signature MW red crown wind piece. 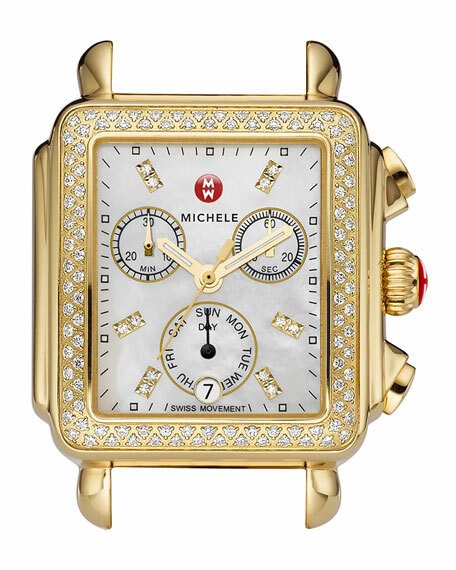 Easily interchangeable with any MICHELE 18mm strap (sold separately). Daniel Wellington "Classic Sheffield" watch. Plated stainless steel case, 36mm. Black dial with baton hour markers. Mineral crystal; logo detail. Daniel Wellington "Classic Sheffield" watch. Plated stainless steel case, 36mm. Black dial with baton hour markers. Mineral crystal; logo detail. Two-hand Miyota GL20 movement. Interchangeable black leather strap. Water-resistant to 3 ATM. Batteries included. Imported. Audry watch with alligator strap by Gomelsky. 36mm round stainless steel case and hardware. Opaline dial with baton and round time markers. Genuine gray alligator strap with thorn buckle. Logo text at 12 o'clock index. Two-hand movement. Made in USA of Swiss materials.